Did you know that over 47,000 people in Australia, under the age of 25 are homeless? That is nearly half our homeless population. Did you know that couch surfing, staying with friends, sleeping in the car, any form on unstable or temporary accommodation is classed as homeless. One of the big issues with homelessness is it is so hidden. I have spoken with people who know 50% of their children's friends do not have stable accommodation. There have been times in my life where I didn't have stable accommodation. I was living in a garage, sleeping on friends lounges, I have slept in the car once and another time I had to move interstate. Most of those experiences happened when I was under 25. The worst was only last year, when I was 27 and 28, but I know of so many people under 25 how don't have much hope for their future because of how they are living. What would you do if you knew your children's friends were homeless? Would you offer somewhere to stay? Would you try to get them some help, direct them to services that give assistance or would you stay out of it? One way you can help youth homelessness is with Youth Off The Streets. 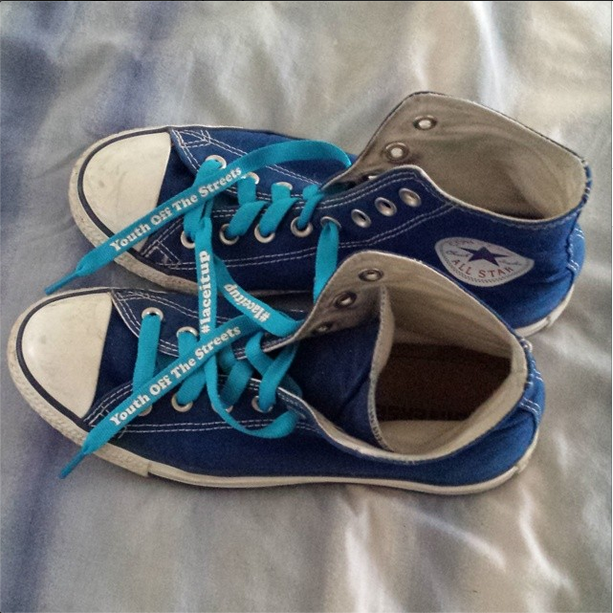 Buying a $5 pair of laces helps raise funds to go towards helping homeless youth, plus wearing them helps raise awareness and start conversations. I have been amazed by how many people here in Canberra are oblivious to our high rate of homelessness. We have the second highest rate in the country, yet it is so hidden.